An unbuilt island tunnel, an unbuilt Queen Street subway, an unbuilt tower atop the former Eaton’s at College Park — these are among the dozens of unrealized architectural dreams revisited in Osbaldeston’s first book on Unbuilt Toronto. 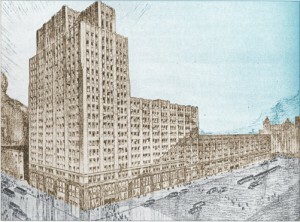 In one 1945 scheme, Toronto’s modern city hall would have resembled one of those receding 1930s-style skyscrapers common in Buffalo and would have faced west toward Osgoode Hall, rudely turning its back on Old City Hall. 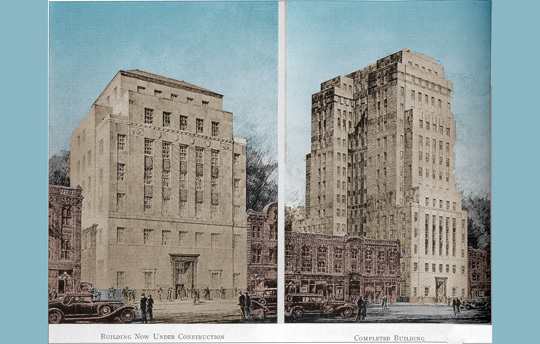 Not long ago Dundurn Press published Unbuilt Toronto 2: More of the City That Might Have Been, once again reminding me of writer Robert Fulford’s apt phrase “accidental city” to describe the present urban reality. That’s precisely what Osbaldeston did in telling us of innumerable public works that never were such as monuments along University Avenue, Government House, Whitney Block, a 1910 subway and radial railway plan, and a 1976 plan for the Yonge-Dundas square (southeast corner) that demonstrates that the idea for a lively public square at that intersection had been floating around for many decades. The previous suggestions for the square seem as cluttered and artificial as the plan that actually came into existence. Notable commercial buildings that never were — like those 19th-century “castles in the air” often mentioned in Victorian literature — include an earlier version of the Confederation Life Building that was substantially altered; a never-built Palace Hotel that was eventually superseded by the King Edward Hotel; various bank buildings and skyscrapers; and a 1925 design for the Canadian National Building at King and Yonge, a structure that would have briefly held the title of tallest building in the British Empire.